Are you looking for a midsize sedan that promises a fun, efficient and affordable drive? Look no further than the 2018 Mazda6. Armed with a refreshed design, an arsenal of exciting powertrains and a wealth of next-generation features, the Mazda6 stands out from the automotive crowd. Learn more about the latest Mazda6 design and how it stacks up against the competition in this 2018 Mazda6 vs 2018 Toyota Camry comparison. 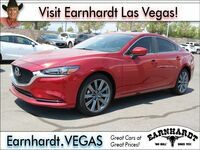 A fan favorite at Earnhardt Mazda Las Vegas, the 2018 Mazda6 features a more diverse, luxurious lineup with five premium grades – Sport, Touring, Grand Touring, Grand Touring Reserve and Signature. With room for five passengers in a cabin that measures 99.7 cubic feet and provides 14.7 cubic feet of trunk space with 60/40 split-folding rear seats, the Mazda6 is perfect for family road trips or day-to-day errands. What Are the Differences Between the Mazda6 and Toyota Camry? When a family searches for a new car, price and affordability are almost always at the top of the list and with an affordable price and a wealth of standard features, the Mazda6 provides incredible value in this 2018 Mazda6 vs 2018 Toyota Camry comparison. 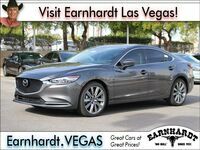 Mazda6 models start at just $21,950 and feature an 8-inch MAZDA CONNECT™ touchscreen infotainment system, Bluetooth capabilities, push-button start, G-Vectoring Control, a leather-wrapped steering wheel and much more. Drivers who desire a more luxurious drive can opt for the all-new, top-of-the-line Mazda6 Signature trim, which will feature plush Nappa leather upholstery, Japanese Sen wood interior trim, Ultrasuede® dashboard trim, heated and cooled front seats, a heated steering wheel, heated rear seats and a 7-inch LCD display. Technology upgrades are another asset of the Mazda6 spec sheet with an Active Driving Display with Traffic Sign Recognition, an Adaptive Front Lighting System and an 11-speaker BOSE® Premium sound system. Under the hood, the 2018 Mazda6 remains one of the most athletic, fun-to-drive options in the midsize sedan class. A 187-horsepower 2.5-liter SKYACTIV®-G four-cylinder engine sets the bar high and pairs with a six-speed SKYACTIV®-Drive automatic gearbox to make 26 mpg in the city and 35 mpg on the highway. Drivers who want a do-it-yourself manual transmission can opt for the six-speed SKYACTIV®-MT transmission – a feature that the Toyota Camry does not offer. 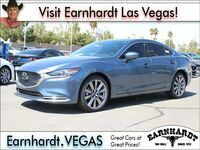 Amp up performance when you opt for the Grand Touring trim, equipped with a 250-horsepower 2.5-liter turbocharged SKYACTIV®-G four-cylinder engine that will make 31 mpg on the highway with a six-speed SKYACTIV®-Drive automatic transmission. 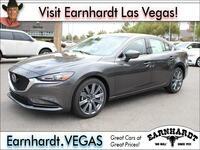 Visit Earnhardt Mazda Las Vegas today to find the 2018 Mazda6 that best fits your lifestyle and budget!